The Horne family with former Tide player Eryk Anders. 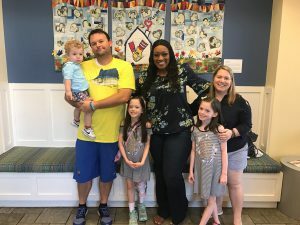 Our latest family story is from the Hornes, who traveled all the way from Fairhope so daughter Katelynn could see the doctors at Children’s of Alabama. RMHCA is grateful our House can accommodate families of five like the Hornes: Dad Brett, Mom Heather, and their kids Katelynn, Emmalynn and Keith! Our first stay at the Ronald McDonald House in Birmingham, Alabama will not be our last. It was a wonderful experience considering all we had to do with my daughter’s daily appointments. All the staff was very friendly. April, the Family Programming Director, became my kids’ best buddy after showing them the toy store where they could go “shopping” for free. And the meals provided were wonderful! My kids ate food they typically do not and enjoyed it. 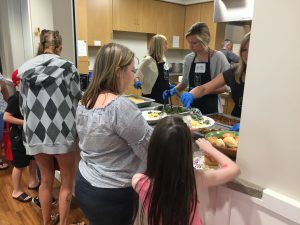 After a long day at the hospital, you do not feel like going to a restaurant or cooking, so having nice families provide healthy meals was a bonus. 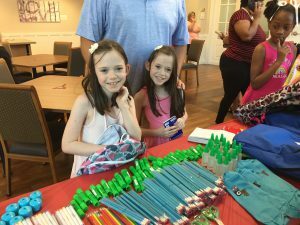 Emmalynn and Katelynn check out the school supplies donated by a local church. When we were at the House, we were also able to attend a special back to school event and it was amazing. It started us off with a lot of supplies, donated by a local church, and was a fun event for the whole family. My kids, of course, enjoyed the ice cream from Good Humor! 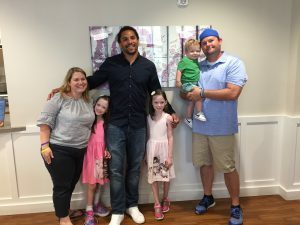 It was a joy to meet a celebrity like Eryk Anders while staying at the House. He used to play football for Alabama! This event made me realize how many people want to give back. Another amazing benefit of staying at the Ronald McDonald House was that we got passes to go to the McWane Center. My family really enjoyed this and it was a blessing to have this option to go out and be together in a fun setting. Of course, the location of the Ronald McDonald House was fabulous. It’s so close to everything we could walk, which was a nice change of pace. Upon leaving the Ronald McDonald House, we were sad and grateful, yet excited for the new relationships we formed. Thank you to ALL the staff and families that make Ronald McDonald House an option for families like ours. We hope you enjoyed reading about the Hornes stay. 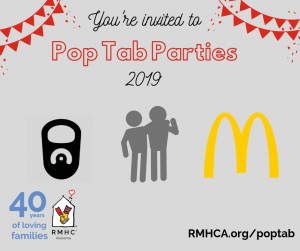 They are just one of the 73 families we help each night at the Ronald McDonald House, plus so many more through our Ronald McDonald Family Rooms in Birmingham and Tuscaloosa. If you’d like to help, please consider making a donation or signing up to volunteer today! Heather (gray shirt) says her kids always enjoy the home-cooked meals. 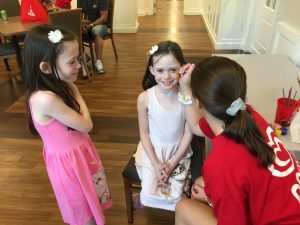 Katelynn and Emmalynn enjoy face painting at the Back to School Extravaganza. The Hornes with April after “shopping” in the toy store.